For groups or individuals. Each of these seven sessions is designed to last approximately one hour. Included are engaging Bible study questions and answers, life-application questions, suggestions for fellowship activities, and seven coffee-themed recipes. “Honesty, encouragement and Biblical truth drip from this study. 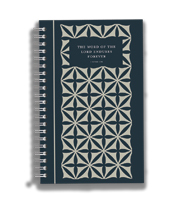 Grounded in the realities of life yet abundant in the richness of scripture this study is perfect for a mom’s group or gathering of women. Each lesson includes questions for self-reflection and tangible experiences that point to the sweet truths found in the Word. Through rich coffee shop metaphors, Deb provides a space to dwell in God’s presence overflowing with grace and love. You can picture, better yet taste the richness of God’s goodness poured out for you. Drink deep the love that Jesus has for you in this book. 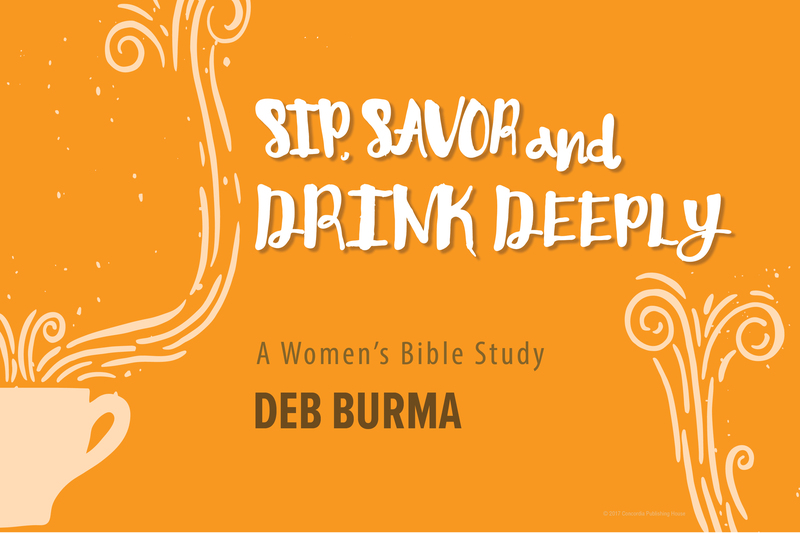 Deb Burma is a sought-after speaker for women’s conferences, retreats, and leadership workshops. She is the author of several Christian-living books, Bible studies, and devotionals, including Stepping Out, Living a Chocolate Life, and Beautiful Feet. Deb is a follower of Jesus, a wife, and a mom. She is a devoted coffee-mocha-latte-cappuccino drinker too. Ready to Fill 'er Up? So enjoyed all the creative analogies used to compare coffee terms with our Christian Life in this study! The word pictures were easy to relate to and got the our thoughts percolating during our study discussions, but also helping us remember the concepts from week to week. Our Bible study group used this fun and deeply satisfying, scriptural study, as an excuse to meet in a different coffee shop every week. We worked through each chapter together on the spot. It was easy to make the connections from the Bible and apply them to our lives, with the author's easy to relate to, style. Also loved the extra ideas and recipes at the end, taking the study a step further as a way to share and apply. The layout of the study is put together so well, and consistent from week to week. Let this study fill your cup to overflowing with God's grace and assurances, as you grow in God's Word! Sip, Savor, and Drink Deeply is so well done. It has a perfect balance between Bible knowledge and life application. I appreciate how this Bible study relates to things that women experience in their everyday lives. Coffee interests a lot of women. But this study is more than a great read over a cup of coffee. Not only will women grow from it, but they will learn to apply it daily. That, in turn, will spill over into other areas of their lives and they will use it to share with another friend, neighbor, family member, co-worker, etc. They will be Living Lights in the lives of those whom God has placed near them. I appreciate searching Scripture, having information to think and ponder, and having Biblical characters like King David. King David is not just merely a great man of the Bible, but someone whom we can learn from so that we can see God’s love for us and know He will never leave us. Even when we daily sin, God is there to cover us with His grace and forgiveness through Christ. We can live in that Grace and forgiveness everyday. I highly recommend using this for personal study or in a group setting. You will be glad you did! Just like a good cup of coffee, this Bible study is energizing, and works well either individually or with a group. 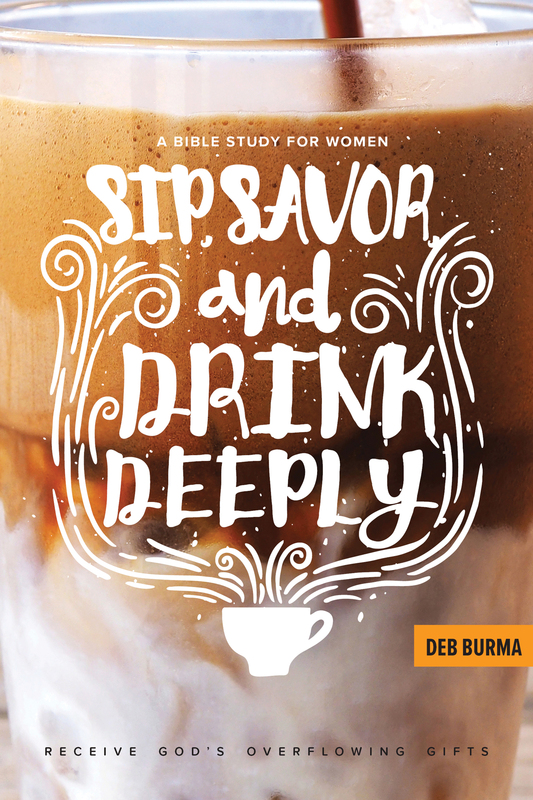 "Sip, Savor, and Drink Deeply" perfectly describes this meaningful Bible study. 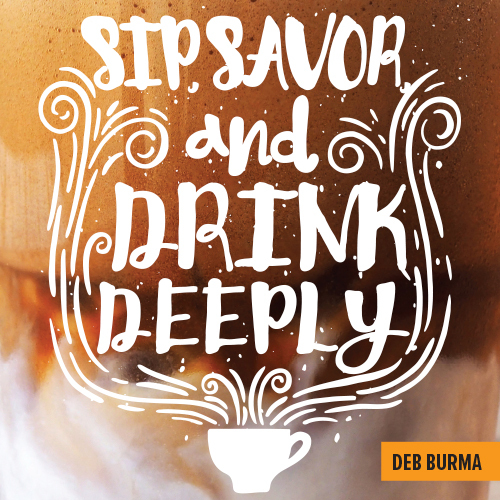 Using fun coffee analogies, Deb Burma masterfully digs into real life issues and examines how God address these allowing the reader to sip, savor, and drink deeply from His Word. Over and over, as I read this Bible study, God's Word powerfully touched my mind and refreshed my soul. For beverage lovers of any kind! As with all Deb’s books, I feel as though in this one, she is speaking directly to me, almost like we are sitting and having coffee together. She has a writing style that is very personable and creative. Her perspective is enlightening and she helps me discover things and to go and grow deeper in my walk with God! Well done! This study touches the reader from page one. 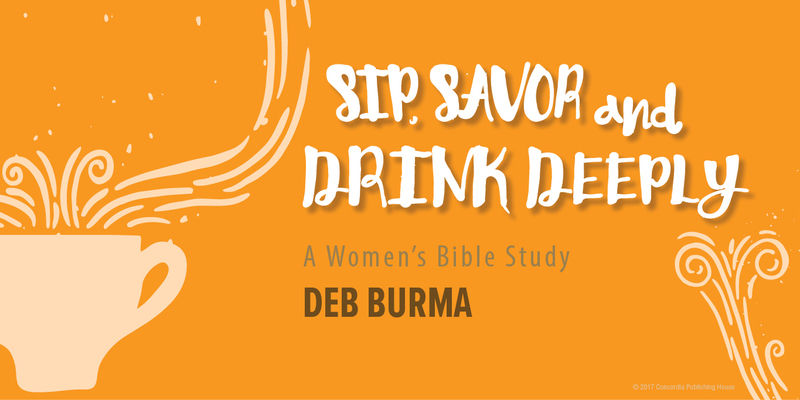 Deb Burma “blends” Scripture, heartfelt questions for discussion and contemplation, activities, and simple recipes to “brew” a wonderful Bible study. So grab your favorite cup and enjoy “filling up” with Jesus. A Fun AND Meaningful Bible Study! If you’re looking for a fun, yet meaningful Bible study, check out Deb Burma’s new book: Sip, Savor and Drink Deeply. This study refreshed my thirsty soul. Using coffee analogies and word pictures Deb explores God’s Word–especially the topics of God’s refreshing grace and how that grace fuels our everyday lives. Throughout the 7-week study, there are ample opportunities to drink deeply from God’s Word. And as we savor the Word, we receive His peace and joy. The book also includes personal stories, fun coffee facts, delicious recipes, and even some coffee-themed projects that would be especially fun for groups to complete together. The imagery in this study helps us grab onto concepts that free our souls and deepen our relationship with Christ. So grab a cup of your favorite cup of coffee or tea, settle into a comfy chair with Sip, Savor and Drink Deeply and refresh your soul through God’s Word. Better yet, invite a few friends to join you! Deb Burma has a very special gift for making the reader feel like he or she is sitting just across the table having a cup of coffee and good conversation. This book will hit home with many as it discusses the importance of taking time to fill (and keep full) the most important cup-our own cup-by taking in the Lord's word. She guides the reader to relate His word to daily life in a practical and fun way. I love the fun surprises in the book along the way-recipes, coffee trivia, even craft ideas! You will love this book and if you have ever thought about a book-based Bible study, this would definitely be a great place to start! This book has been a wonderful way to take time away to read, study and reflect on my life. We get so busy and easily distracted with the tasks of everyday life. Deb has such a dynamic way of placing you in the book and really leaves you feeling like you've just had coffee with a dear friend as you discuss and learn how to deepen your relationship with Christ. I really look forward to taking time to read, sip and savor the book as I refill my empty cup with God's word and my heart with His love, grace and forgiveness. Through this book and my time of study I have grown and know He mends my broken, stained and worn out cup. I highly recommend this book, vey easy to read, one you'll look forward to everyday! Deb's easy flowing style pulls you right in as though you are enjoying the company of a friend while you savor the topics, growing ever more close...what a friend we have in Jesus! Grab a cup of your favorite brew and dive in, you will find excellent top of mind tidbits to keep your focus dialed in throughout your day, and new nuggets to look forward to in each chapter. Thank you Deb for another great study into Gods word. For your next women's gathering enjoy a cup of coffee tea or hot chocolate and allow God to fill your cup! Deb shows creativity, recipes and advice on how to help us define our faith and "our faith relationship with God in Christ is a springboard to action". Excited to share this with others!